Your Dog Oughta Be In Pictures. Have you ever noticed how dogs are instant ice-breakers in social settings? Ask somebody about their line of work, their family or how they’re doing and the response might include a grunt, shoulder shrug, and two words at best: it’s okay; they’re fine; I’m good. But ask somebody about their dogs, and the floodgates open right up. 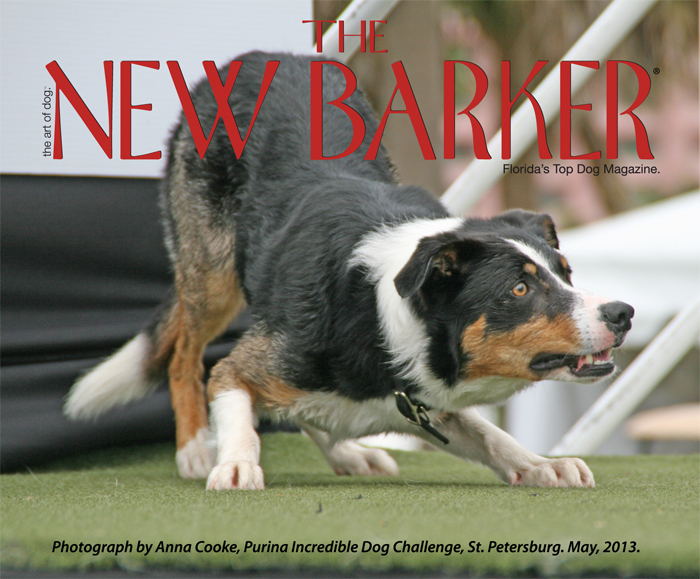 When the first issue of The New Barker dog magazine rolled off the presses seven years ago, we didn’t have a problem filling its pages with fun content about Florida dogs. Our concern as to whether or not we would be able to continue to provide readers with original, relevant content in subsequent issues was quickly put to rest. Stories abound, and we find ourselves planning which future issue will feature a developing story. There are just so many wonderful stories to tell. Still, we’d like to get back to our grassroots and hear more about the dogs of Florida. Your dogs. The everyday heroes, the lap dogs, the heart dogs, the dogs who make us laugh. And, so here are three fun ways for your dog to be part of an upcoming issue of The New Barker dog magazine. One: We’ve partnered with Summerhill Television, an international production company based in Canada. They’ve been given the green light to develop a television series, Dog’s Best Friend, that will document incredible friendships between dogs and other animals. They have asked The New Barker to reach out to Florida dog lovers for a possible audition. Does your dog have a friendship with a dolphin, a donkey or a horse? Do you think your dog’s relationship with the family cat or bird is particularly special (yes, of course you do). Please drop us a line or two about the friendship via email (anna@thenewbarker.com). In the subject line put “incredible dog friendship.” Please be sure to include your contact information (phone number, name, Florida city in which you reside). Two: Is your dog swimsuit-ready? Send us a photograph of your dog in his or her best swim suit attire or beach gear. Beer belly or six-pack abs, we want them all. Email your photos with the dog’s name and your contact information to anna@thenewbarker.com. In the subject line put “swimsuit ready.” Your angel could be in a centerfold. Three: While going through personal belongings, we came across some old family photos. One was of Sonny Cooke, our publisher’s older brother, and the family’s first dog, Tippy (circa 1943). 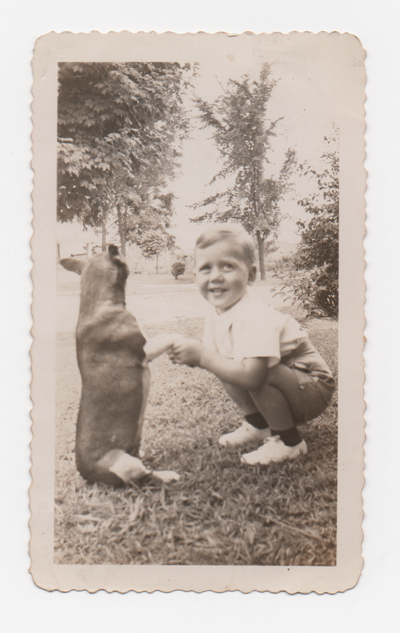 We started wondering how many old photos of family dogs have long ago been tucked away in albums or drawers or envelopes. We’d like to develop a story and feature some of those photos. So, take a look around and send us a note via email (anna@thenewbarker.com). If you’re able to scan the photo, send that along too. If not, just send us a description and your contact information so that we can call you. We’ll take care of the rest. As always, we look forward to hearing more about you and your Florida Dogs. Previous Previous post: K9s for Warriors. Seeing Eye Dogs for the Mind. Next Next post: Good News for Moms: It’s Puppy Week for Kids on PBS.